You know those big square display ads on Websites that show a snippet of video instead of a static image? Well imagine if when you clicked on one of those an ad took over the middle of the whole page with a video, a map, some interactive elements, and maybe a gallery of more videos. Those are the types of engagement ads a new video ad network called Firefly Video is launching with today. Firefly Video has already been working with 25 advertisers in private beta. The ads will typically show a corner with a rollover message that will trigger the ad. Here is an example of a Mercedes-Benz ad. These are designed to allow advertisers to re-use their existing TV commercials they’ve already spent millions of dollars on. And unlike pre-roll ads, they don’t interrupt the online experience. 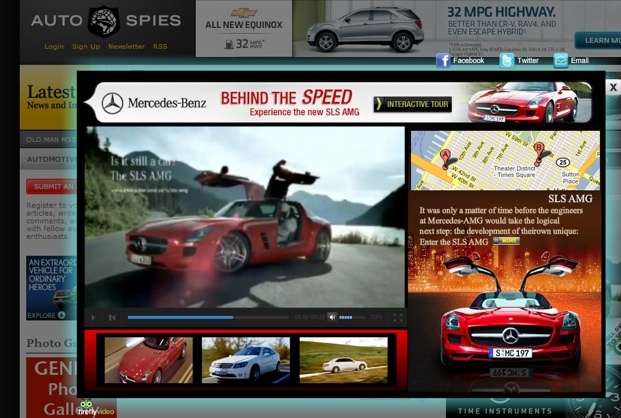 They are not even shown in front of videos, but rather introduce video ads onto regular Web pages. There is nothing terribly new about engagement ads. Videoegg has been pushing them for years. But Firefly’s entrance may signal that engagement ads are becoming more promising. It is betting its whole business on them, with the help of sister startup Tribal Fusion, one of the largest ad networks out there. (Both are owned by holding company Exponential Interactive). Initially, Firefly will get ad inventory through Tribal Fusion, which reaches about 120 million uniques in the U.S. It will also use Tribal Fusion’s data to target the ads by any number of variables—geographic, demographic, time of day, content verticals, or retargeting people who have visited the advertiser’s Website. Firefly buys regular ad inventory at a CPM (cost per impression) rate, and sells it to advertises at a higher cost per engagement (CPE) rate, much like Criteo does with retargeted ads. So it’s got to get its targeting right in order to make sure enough people engage with its video ads to make up the difference.